When she first lost her husband to a hazardous power line, her brother-in-law tried to lift her gloom by volunteering to marry her. It was a happy marriage, until she lost him, too, to the same fault line, which is now consuming linemen in Kashmir in a deadly routine. On the day of his death, Bashir Ahmad Khan had left his home in Zogoo, Budgam to repair a fault-line with a smile on his face. He had asked his wife, Begum Jan to make him a cup of tea which he would take after dispensing his duties. On his way to work, he had greeted his friends, and had displayed his familiar “full of life” attitude. But today, that smile, that vow, and that attitudinal walk has remained as his lasting memory for his family and townspeople. Bashir’s hometown is non-decrepit, tucked ahead of Budgam’s sleepy Khan Sahab locality. In a medieval marketplace, two neighbourhood kids sitting idly on a roadside shopfront volunteered to show me Bashir’s address. It was a tiring uphill walk towards the dead lineman’s house. One of the kids, who assumed the role of a guide, was gracious enough to lend me his Kangir. The air had already turned freezing cold and the sky above was draped in a sheet of grey clouds. Just as I was at some distance from Bashir’s house, I met his widow who was going to the market. She politely turned back towards her single-storey house. Even before I could begin the conversation, the room facing a desolated courtyard was packed to the burst with people – the two kids, Bashir’s widow, his sister Farida and other members of the house. There was a whole gamut of rural courtesies in its dazzling display that day. Begum Jan began to lay bare her ordeal wearing the simplicity of a rural woman. Before employed as a contractual-labourer in the Power Development Department (PDD), Bashir had to slog to get this job. It had been 25 years since he was working for the PDD before being electrocuted to the death, last year, on October 19. His family had exhausted all the methods to dissuade him from taking this job because of their familiarity to the tragedy associated with it. 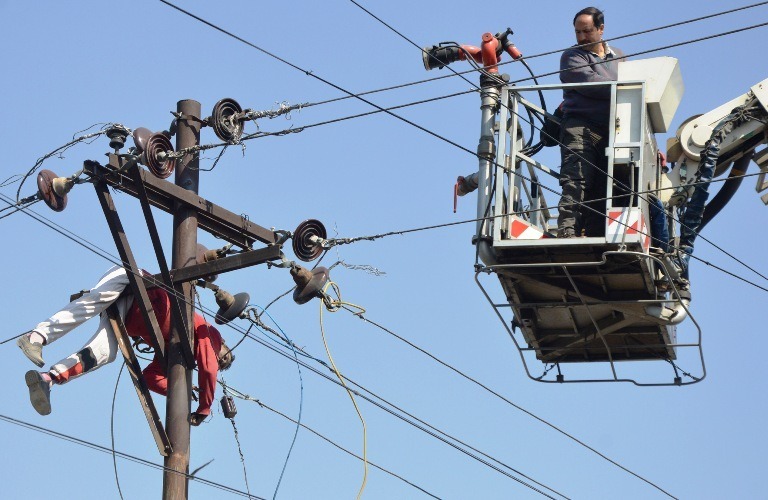 Much of their fears stemmed from the routine news of linemen being electrocuted in Kashmir. But despite becoming a war-cry of sorts on social media, such deaths—which could’ve been prevented by providing proper kit to linemen—continue to take place, without creating the much-needed defense mechanism in the concerned department. Bashir would brush aside his family’s fears for feeding his wife and his six sons. His death was a second time tragedy that had befallen Begum Jan.
25 years ago, her first husband Ghulam Muhammad had also died of electrocution when he was busy repairing a fault line. After Ghulam’s death, his younger brother, Bashir married his young widow. Bashir was employed on contractual basis in PDD which he served laboriously for more than two decades until he met his sibling’s fate. Even though Bashir was a permanent employee, his family hasn’t received any compensation from the department or the government, the mournful sibling continued. Begum Jan with her family. Later, his friends and colleagues led a massive procession hoisting his charred dead body. Same had been the case with his elder brother, Ghulam. After Bashir’s death, the family was duped by a conman who had presented himself as some Samaritan. The man had claimed he had been sent by some high official. “He demanded a hefty sum from us saying that the amount is needed for our case to move up and that we would receive compensation soon,” Farida said. Out of naivety, Bashir’s despairing family agreed to pay him some two thousand rupees which he had taken and whisked away, never to be seen again. It had turned out to be an act of swindling. It was a big amount for a family who had lost their two breadwinners in less than 20 years while serving the ‘indifferent’ department. Leaning against the wall throughout the conversation, Begum Jan stood motionless, lost in thoughts. Her body language embodied an image of a grieving widow. With time, all the claims and promises that friends and colleagues of Bashir had made to Begum at the time of his death, saw themselves expiring to futility. Left to fend for herself, Begum Jan’s unspeakable resilience has allowed her to survive the tragedies that befell her at different phases of her life. But now, as life has consigned her to a state of pitiable penury, Begum Jan finds it very hard to manage her financial affairs.